This series of tutorials shows you how to deploy (publish) an ASP.NET web application project that includes a SQL Server Compact database by using Visual Studio 2012 RC or Visual Studio Express 2012 RC for Web. You can also use Visual Studio 2010 if you install the Web Publish Update. For an introduction to the series, see the first tutorial in the series. For a tutorial that shows deployment features introduced after the RC release of Visual Studio 2012, shows how to deploy SQL Server editions other than SQL Server Compact, and shows how to deploy to Azure App Service Web Apps, see ASP.NET Web Deployment using Visual Studio. In this tutorial, you set folder permissions for the Elmah folder in the deployed web site so that the application can create log files in that folder. When you test a web application in Visual Studio using the Visual Studio Development Server (Cassini), the application runs under your identity. You are most likely an administrator on your development computer and have full authority to do anything to any file in any folder. But when an application runs under IIS, it runs under the identity defined for the application pool that the site is assigned to. This is typically a system-defined account that has limited permissions. By default it has read and execute permissions on your web application's files and folders, but it doesn't have write access. This becomes an issue if your application creates or updates files, which is a common need in web applications. 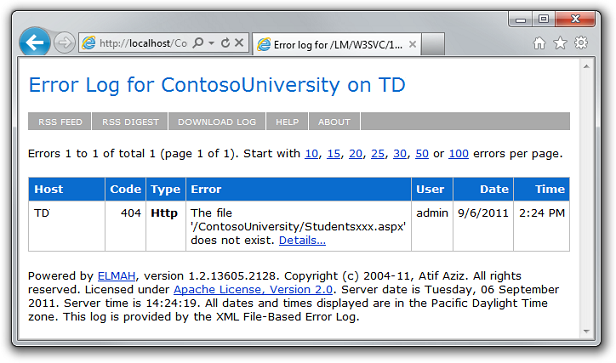 In the Contoso University application, Elmah creates XML files in the Elmah folder in order to save details about errors. Even if you don't use something like Elmah, your site might let users upload files or perform other tasks that write data to a folder in your site. Reminder: If you get an error message or something doesn't work as you go through the tutorial, be sure to check the troubleshooting page. To see how the application doesn't work correctly in IIS (although it did when you tested it in Visual Studio), you can cause an error that would normally be logged by Elmah, and then open the Elmah error log to see the details. If Elmah was unable to create an XML file and store the error details, you see an empty error report. In Windows Explorer, navigate to C:\inetpub\wwwroot\ContosoUniversity. Right-click the Elmah folder, select Properties, and then select the Security tab. Click Edit. 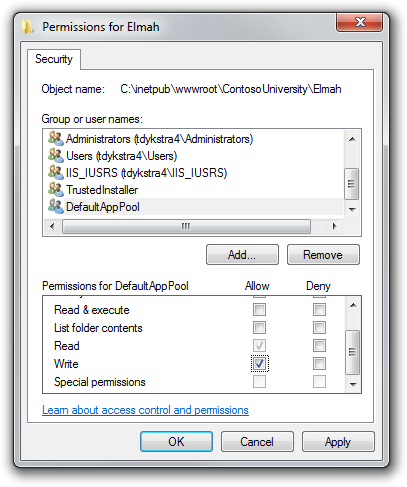 In the Permissions for Elmah dialog box, select DefaultAppPool, and then select the Write check box in the Allow column. 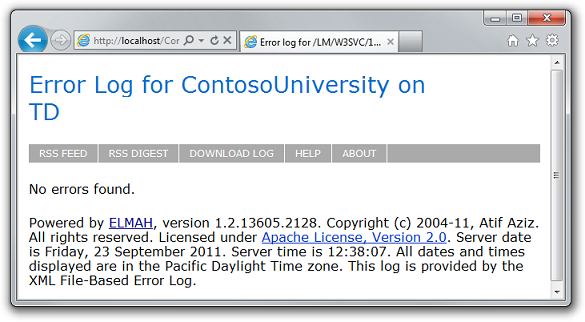 Test by causing an error again in the same way (request a bad URL) and run the Error Log page. This time the error appears on the page. You also need write permission on the App_Data folder because you have SQL Server Compact database files in that folder, and you want to be able to update data in those databases. In that case, however, you don't have to do anything extra because the deployment process automatically sets write permission on the App_Data folder. 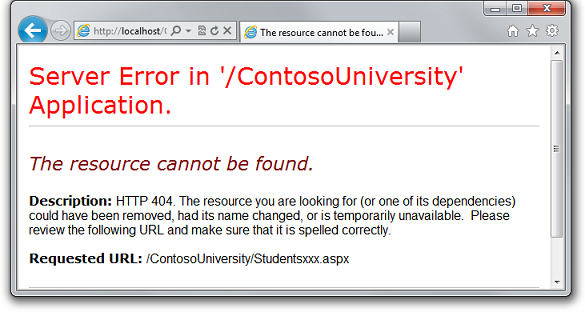 You have now completed all of the tasks necessary to get Contoso University working correctly in IIS on your local computer. In the next tutorial, you will make the site publicly available by deploying it to a hosting provider. In this example, the reason why Elmah was unable to save log files was fairly obvious. You can use IIS tracing in cases where the cause of the problem is not so obvious; see Troubleshooting Failed Requests Using Tracing in IIS 7 on the IIS.net site. 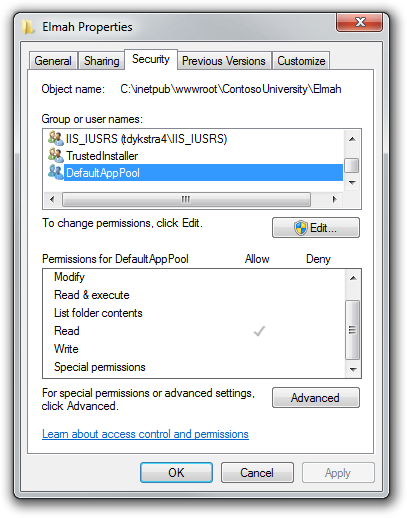 For more information about how to grant permissions to application pool identities, see Application Pool Identities and Secure Content in IIS Through File System ACLs on the IIS.net site.